Traditional cutting methods may prove to be hard options for most adults as they require more effort, dexterity, and precision to execute. Because of that, best electric knives came into the market to make cutting much more better. With that being said, I have compiled a list of the best electric knife on the market for all of your cutting needs. You can also find each one’s advantages and disadvantages. Read away to find out which is the best electric knife for you! This electric knife features BPA-Free high quality stainless steel blades which are full-sized . It also features a 4 feet cord which is sufficient for most kitchen set-ups. If you’re worrying that you might cut yourself while using this product, worry not as it also features a safety button feature. Of course, one of the many things that should be considered too is the aesthetic feature of the product. The Cuisinart CEK-40 Electric Knife features an ergonomic black handle which is both aesthetically pleasing and comforting. Along with this product also comes a carefully crafted wood block where you can store your electric knife pleasantly. This electric knife boasts its 7 and ½ inch blades which is sufficient for most cutting needs. As such, it showcases its ability to cut a huge variety of bread. It also features stainless steel blades and a carving fork for other needs. This electric knife also features a non-slip trigger which is beneficial as the trigger button is a bit small. One of the many things that it also features is a small storage case which can conveniently house the electric knife and the carving fork. Though this electric knife is mainly created for filleting fish, it can also be used as an option for a variety of other types of food. You may wonder why, but because It has a 110 power wattage, you can ensure that it always has more than enough power to cut through the food you’re trying to slice and fillet. 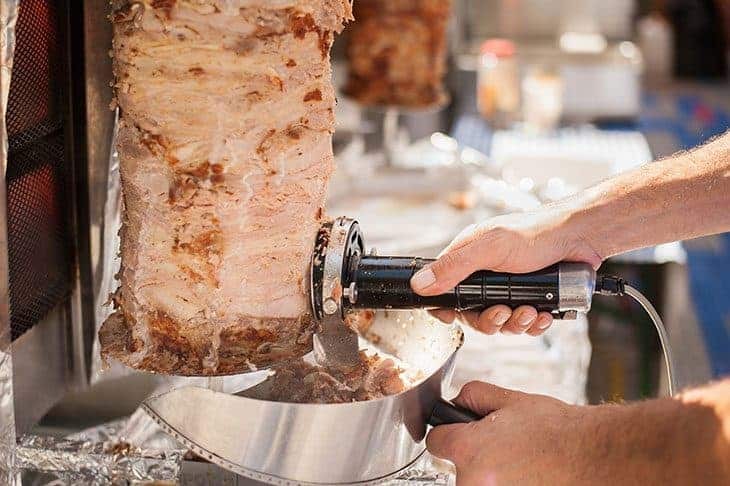 It also has 8-inch blades which ensure no bit of your food is left unsliced. 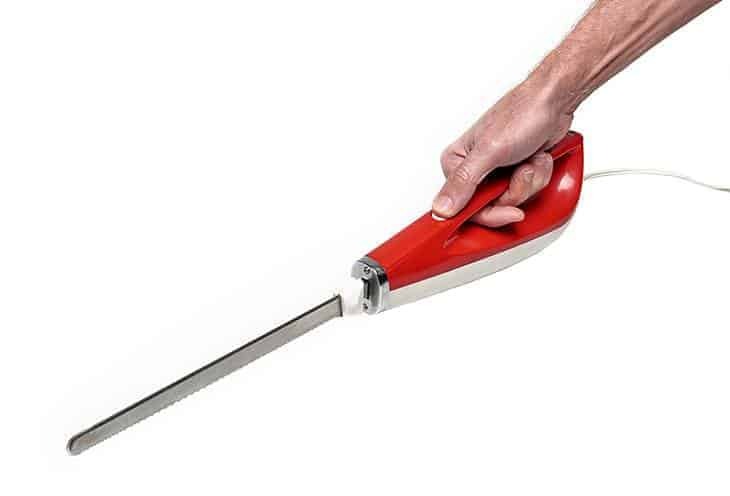 This electric knife also has an 8-foot power cord which is very generous for most kitchen set-ups and ensures you can use this tool no matter how far the electrical sockets are. It also features a very ergonomic handle which ensures you feel comfortable while using this electric knife. A trigger button is also conveniently located at the handle for your needs. Lastly, it comes with different kinds of blades for your cutting needs. 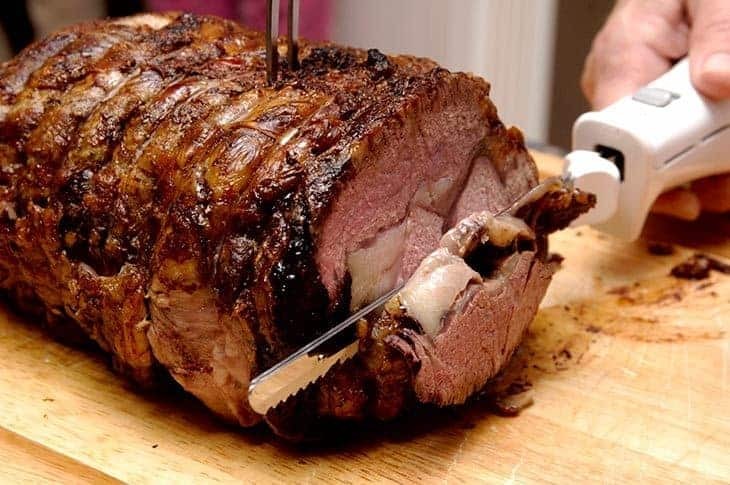 Again, this electric knife is better suited for filleting and deboning, however, it also has the potential to slice through pork, beef, lamb, chicken, and partially-frozen meat. It has a 7 and ½ inch blade which is a bit shorter but makes up for by its serrated blade. The blade itself has a very sleek design which justifies its great ability to fillet and debone fish.It also features an 8-foot long power cord which allows the user to use this gadget even when the electrical sockets are far. The handle of this electric knife is also ergonomic. It also features a switch conveniently located just below the top of the handle. You have to hold the switch for it to start operating, which can both be an advantage and a disadvantage. However, for safety purposes, I personally believe this is an advantage. This electric knife features very sharp blades that can cut easily through what you’re trying to slice. From this list, they have the longest blades (12 inches) ensuring that no bit of food is left untouched. This length is also beneficial for cutting long and artisan types of bread. The Mister Twister 120V Electric Knife also features an ergonomic handle with a safety-lock feature which makes it easy to store anywhere in the kitchen or house. This electric knife also boldly shows its neon green and yellow paint which makes it more attractive for children. This may seem to offset at first but they’ll be more inclined to help you out in the kitchen. Whether or not this is a disadvantage, it’s up for you to decide! The replacement blades for this model also comes in various dimensions so you’ll always have what you need. 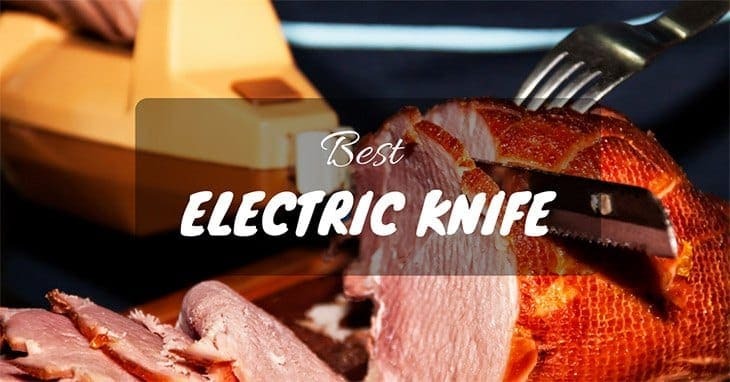 Best electric knife – the perfect electric knife for your cutting needs. Get the best for your #kitchen. 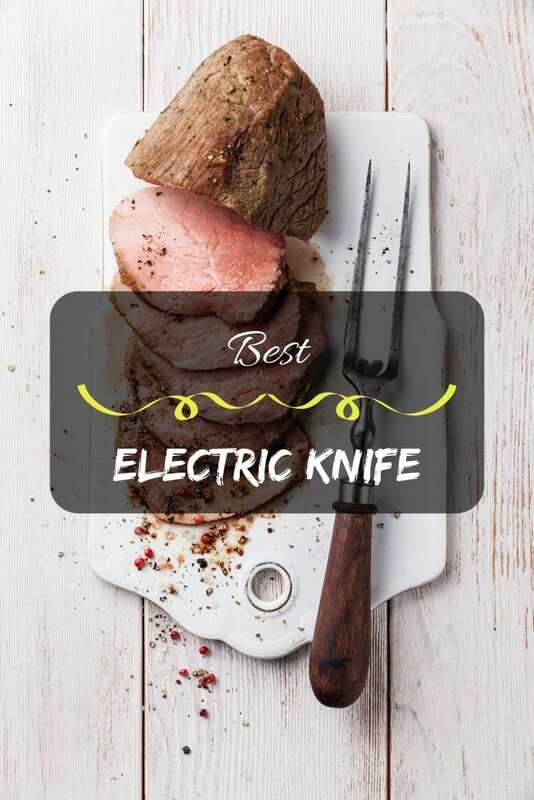 You may be wondering why an electric knife is so beneficial, but before we tackle what are the different factors that you should consider and what to find when buying a product, let us first discuss and find out what are the different things and factors that make the electric knife much better than the traditional knife. Most people consider the traditional kitchen knife as much better since you control every aspect of your instrument and your skills will do the job for you. However, most people just don’t have this kind of skill and familiarity with the instrument, and more will even have lesser physical energy in order to be able to do so. 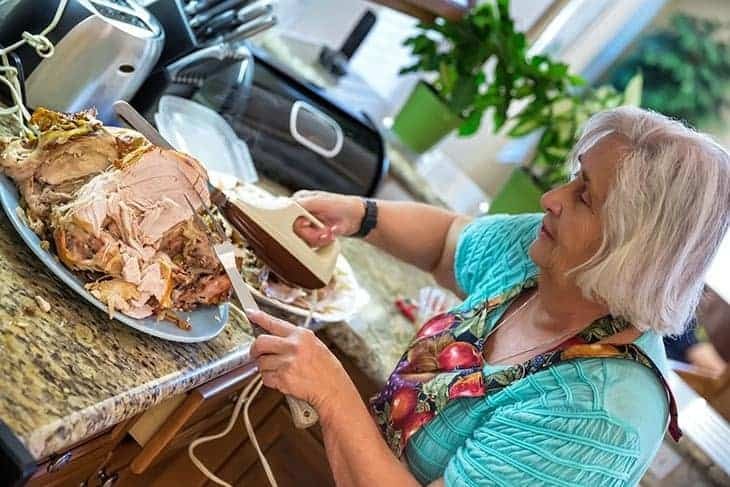 Electric knives were invented in order to help out the average person in cutting bigger pieces of meat such as turkeys and whole chickens. They were also invented to help aid in cutting more bone-ridden pieces of meat such as fishes, salmons, chickens, and more. Since electric knives are machine-operated, their precision is constant. They always cut with the same amount of energy and motion which ensures equal slices. Because of this, you can just focus on the angle and placement when you are cutting instead of having to worry about having to exert force just to get your cuts through. Because of its consistency in its cutting-time and precision, this also allows the electric knife to be efficient in preparation times. Since electric knives cut through the toughest of meats easily, there is also a lower chance and probability of human fault or error. Electric knives have replaceable blades unlike traditional knives. Because the blades are easily replaced, you don’t have to worry about the quality of your blade’s sharpness. You don’t also have to go through the process of having to sharpen knives the traditional and hard way. You might think that since electric knives are more technologically-advanced, they’re more expensive than traditional knives, right? While that may be the case for some, this isn’t always true. Interestingly enough, most top quality electric knives actually cost less than medium-tier traditional cutting knives. Now that you’ve already grasped just how beneficial the electric knife is, it is now time to dive into the different factors that you should consider when buying an electric knife. After all, you need to get the best for your cutting needs! One of the many things that you should definitely consider when buying an electric knife is portability. Not every electric knife on the market is cordless which means that you need to plug the electric knife to a socket for it to run. You may think that cordless models are better however they can easily run out of battery, and once they do, they’ll start functioning less effectively.Corded models maintain a steady amount of energy however maneuverability may be compromised. It is a good thing though that most top models feature lengthy cords that will allow it to adjust in your kitchen setting. Some top models also feature cordless and cordless modes of the electric knife so you can conveniently switch depending on your needs. The material used to construct the blade is probably the most important factor, as this consequently determines how sturdy and sharp the electric knife is. After all, what good is a knife that can’t cut? As you’ve might already guess, stainless steel blades are the top picks among electric knives. Of course, stainless steel lasts over time, as it blocks rust and tarnishes from growing anywhere around your electric knife. It is actually pretty rare to see electric knife models featuring traditional steel but there are some blades constructed that incorporate mixtures of other types of materials. Most electric knives come with detachable blades that are easily replaced and can even be replaced for other types of blades. If you buy an electric knife that comes with a blade kit, you’ll find different types of blades for different purposes. There are blades for slicing bread, turkey, filleting fish, and generally one blade that is an all-rounder.Blade lengths also vary with 7 and 1/2 - inch long blades more suited for filleting fish. Longer blade lengths are often associated with cutting poultry. The longest blades are often used for cutting bread. It should also be noted that a blade’s handle should be ergonomic and comfortable to use. After all, you can’t focus on what you’re cutting if your hand isn’t comfortable. This factor indirectly relates to a blade’s precision too, as the user will still determine the angles and placement of the blade, and the user won’t be able to do so with an uncomfortable handle.The handle should also feature conveniently-placed switches of the blade’s features. It should be easy to reach with the fingers as so to allow the user to easily turn on or off the blade, access the locking feature, and more. With all the factors that should be determined for choosing the best electric knife, the winner goes to the Cuisinart CEK-40 Electric Knife! This is for a variety of great reasons. It features an 8-inch long knife which is neither too short or long for your cutting needs. It is a great all-rounder. 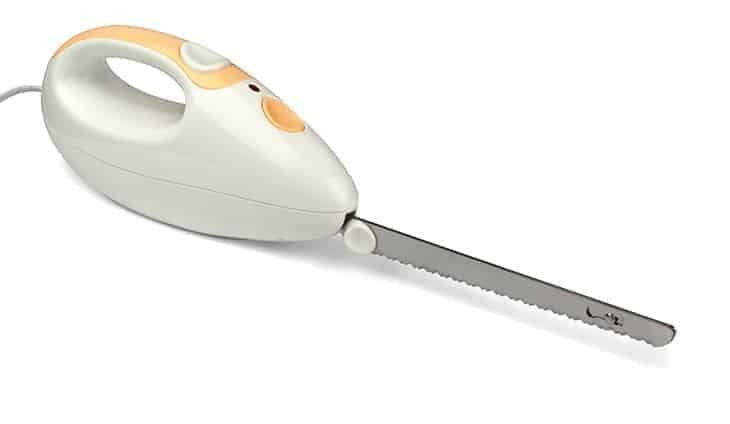 It is a cord-type electric knife but it compensates for this for its 130 watt power cutting power. It also features great stainless steel blades which are easily detachable and replaceable. Overall, this blade will suit all of your general electric knife cutting needs!